A cruise itinerary including the inside passage to Alaska should be right at the top of every nature-lovers’ to-do list! In case you are not sure exactly where an inside passage, or inner passage cruise will take you, let’s start with a short Geography lesson! The Inside Passage is a route large enough for oceangoing ships to navigate the myriad of islands along the North-Western coast of Washington State (USA), British Columbia and up to the South Eastern tip of Alaska. The Alaskan portion of an inside passage cruise will take you along approximately 800 kms of some of the most breathtaking scenery in the world! This section of the inside passage includes over a thousand islands and twenty-four thousand km of coastline punctuated by innumerable bays and inlets, and will take you to the Alaskan cities Juneau, Ketchikan, Whittier (Anchorage) and the fabulous Tracy Arm Fjord. (Not all itineraries include this destination). What to see on your Inside Passage cruise to Alaska? 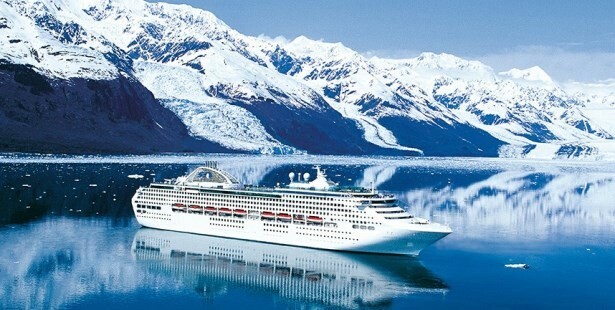 If you have ever imagined standing on the deck of a cruise ship, gazing across the water at snow-topped mountains, endless acres of glaciers, waterfalls, fjords and misty rain-forests, while humpbacked and orca whales cavort around in the water right by your ship, then this is the cruise for you! One of the highlights of an inside passage cruise is your visit to the Hubbard Glacier, North America’s largest tidewater glacier, stretching for over 75 miles and towering over even the tallest cruise ship! (Depending on the itinerary you choose, you will either visit Hubbard Glacier, or Glacier Bay). Both of these glacier destinations are wonderful to visit and both offer the chance to witness a “calving” – when huge chunks of the glacier separate and drop into the sea with a resounding noise, similar to a pistol shot, which reverberates for miles. You will see a host of natural wonders from the deck of your cruise ship while doing the scenic cruise along the inside passage to Alaska, but you are in for even more extraordinary sights when your ship docks at one of the Alaskan Ports. Where else can you go dog-sledding or take a flightseeing (helicopter or Floatplane) tour over the glaciers, lakes and fjords? From Juneau, you can take an air tour to the Sawyer Glacier in Tracy Arm Fjord (if this incredible natural sight is not included in your cruise itinerary), or take a 20 minute shuttle bus to the Mendenhall Glacier. In Ketchikan you can go salmon fishing, see totem poles, catch a zipline ride through the tree tops or go on a Bear viewing safari (best chance of seeing these elusive creatures in their natural habitat is from late July to early September). Of course, while you are there you must try two of Alaska’s most famous exports – fresh wild salmon and Alaska king crab! Several of the well-known cruise lines navigate the inside passage each summer, usually starting around mid-May and ending in August. A typical Itinerary to cruise the inside passage to Alaska would be a 7 night trip starting in Seattle and finishing in Vancouver or Whittier, (the nearest Port to Anchorage). (You could also do the cruise in the opposite direction departing from Vancouver or Whittier). Princess cruises also offer a 10 day itinerary from San Francisco – a great choice with a few extra days at sea and roundtrip 7 day cruises starting and ending in Seattle. Royal Caribbean, Celebrity and Regent Seven Seas also offer several departures from either the Alaskan or USA departure ports.